Hey what’s up. It’s Sam from HiViz LED Lighting FireTech Lights. This is one of ours, we’ve taken it apart, so you can see the inside of it. I’ve actually got the end cap off. One, this thing is all aluminum, so the fixture itself is more durable than most compartment lights, but it gets into a lot deeper where we can dissipate heat a lot better, so the aluminum is great for of course the structure rigidity, but of course the thermal management as well. Let me just show you a couple of styles. There are basically three styles. If you look at “Style 1,” this is kind of your cheaper LED compartment light. It’s going to be a round poly tube that just goes on the inside and it’s clipped inside of the body. That poly tube has a circuit board, and that circuit board has LEDs on it and its usually a fiberglass circuit board. That circuit board runs the length of the compartment. If you look at it from a side view, and this is the side view and it’s got — we put the circuit board this way, going inside and it’s clipped on to the body with a few plastic clips. The wiring comes in the top side. The circuit board clips together at the inside of those pins. So you can push it inside. When those pins get pushed together, the boards lock in place and it’s inside that poly tube. That’s a low cost way to do it and it’s fine because these things are fairly bright. But the problem with this is that LED themselves dissipate heat off the back at the chip, so if the light is dissipating heat off the back at the chip and they are just on a fiberglass circuit board, then there is nowhere for that heat to go and then because that circuit board is inside of a plastic tube, it vibrates back and forth as a truck goes down the road. The fiberglass itself is prone to failure and then the junction where that pins interact is prone to failure and then of course the whole thing being plastic just takes one good whack from a K12 and that thing is trash. The other, “Style 2” is a little bit better and this is the style where you’re having an aluminum extrusion, but the circuit board is cut and built in a whole long batch and then it’s cut in sections and put inside the housing. What happens is these circuit boards are totally encapsulated in an epoxy batch. Epoxy encapsulation keeps them from getting problems with water. It keeps them waterproof, but the problem with that is that the epoxy ends up an insulator and then of course you have a temperature problem, so let me just draw this out. When you look at this type of extrusion, we’ve got a little pocket, and then we’ve got the rest of that pocket and this might go up. So this type of extrusion, the circuit broad that sits in here slides in. The board sits in the middle of this epoxy encapsulation and it’s got LEDs on the top. What happens here is the whole piece is sort of similar towards were it’s extruded, but the circuit board can’t get rid of the heat because this whole area around totally encapsulating around where the chips are is that epoxy, and epoxy is like a plastic and just like with anything, plastic is an insulator. So this style is a lot better than “Style 1” because this is more durable. It’s more waterproof. It gives you a little more light up because it does have some strength to it. But “Style 3” is the FireTech style. We take the circuit board and we built this thing more like we do with one of our scene lights, the FireTech Brow Light. The way our fixture goes, this is the housing right here. If you look at it down the side, it’s shaped like a U. Sitting directly on the housing, is our circuit board. So on top of the circuit board, of course sits the LEDs. But the heat from these LEDs pushes back into the housing and this aluminum housing has ribs on it and those ribs act like a heat sink. This whole big aluminum housing, because the circuit board is banded to the aluminum housing allows way better thermal dissipation and the key to the success of an LED over the life of an apparatus is the ability to manage the thermal load, the ability to shed heat. Because typically, if LEDs get too hot, they break down and they just fail. So the problem is when you band these together, now you’ve got big void space, you know water getting inside. What we do is we epoxy and encapsulate once the fixture has been manufactured, up to the top half of the LEDs, so the board is banded to the housing and then we epoxy the top half and keep the open face, the phosphorus face of the LED out to the atmosphere. But if you look here, you will see how that whole area will be covered in the epoxy potting, so that keeps it totally waterproof. But then we also add a little ridge on the top side and have a gasket right here. If you look at this piece, actually that gasket of material goes on the topside and then we add a lens. That lens goes on top of the gasket when you pop it in place, it creates a waterproof seal. We not only have a waterproof design where the circuit board is in an epoxy encapsulate, you also don’t get water on the LEDs. It also has a lens on top of it, it is waterproof, so the whole housing is designed to be used in higher vibration environments because you don’t have to worry about the “Style 1” type fixture problems, where the circuit broad rattles around inside of the piece of plastic tubing. It is designed for high temperature environments, so like a closed compartment or like a compartment even the underside of a fire truck, where we’ve got dirt, junk and trash, all over these things we’re able to dissipate heat because of these vents and the aluminum housing. We’ve also got the durability of having all aluminum mounting points. When you look at these, the lens gets installed on the top side and then we have an aluminum end cap. This light here has actually been on my truck for a couple of years and we just pulled it back for some testing, but this all aluminum end cap bolts into this extrude housing and when it’s bolted on, there is a little rubber gasket that goes over here. It allows for mechanical fastening of the housing all the way to the fire truck body, so the likelihood of this thing getting knocked off the truck is very low because of this aluminum end cap and aluminum housing holding an aluminum circuit board all onboard. The compartment in the fire truck, you can bang this thing as hard as you want with the K12s, because this thing is inside of the truck body, mechanically attached using aluminum and screws. 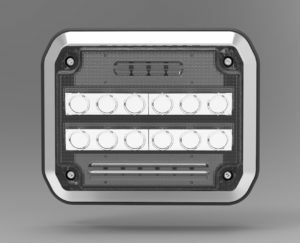 Anyway there is a lot of different types of compartment lights on the market, and I can’t say anybody builds a bad compartment light, but when it comes to FireTech compartment lights, we started with the design requirement. This thing will last for 25 years in service under a fire truck, on a fire truck or anywhere you put it. This is the way we did it. 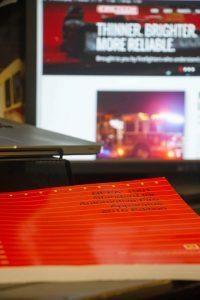 Contact a FireTech Brand Consultant Today! For more information, check us out online at www.hivizleds.com. You can see the Guardian and rest of the FireTech brand scene lighting products. We can be reached by online contact form or call 703-662-3458. Hey what’s up? It’s Sam from HiViz LED Lighting FireTech Lights. Today, we’re here with our freshly designed packaging and the FireTech 4X6 LED headlight. Now this thing is super cool. If you haven’t seen them before, there are a couple of new features that makes this thing a perfect headlight solution for an emergency vehicle or first responder vehicle that makes it a little bit different than over the road vehicles. So, first things first, let’s go ahead and open this thing up and I’ll tell you a little bit about what makes this thing so unique and designed specifically for fire trucks. 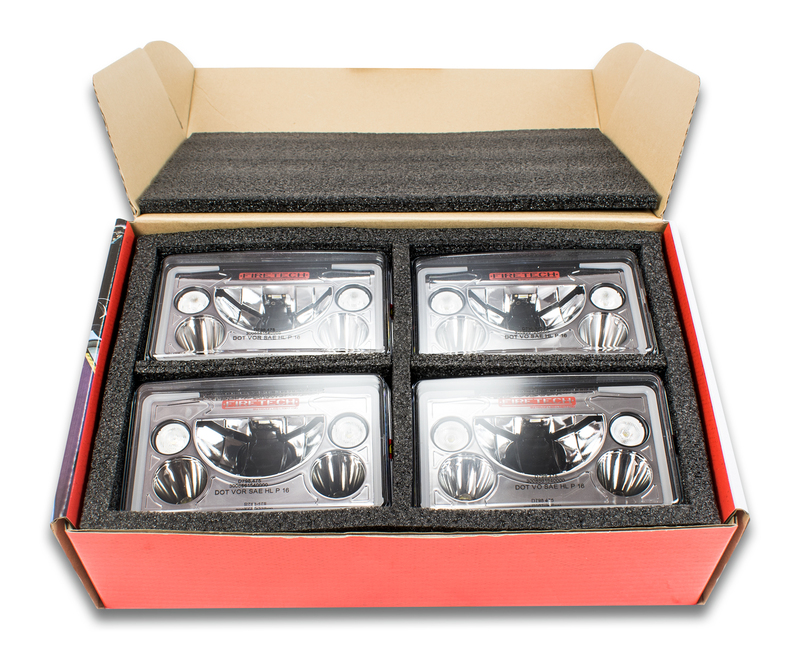 As we open the box, you’ll see this kit contains four LED headlights. We’ve got two high beams, and two high and low combo beams. This thing looks super sick. As we pull these things out, let me just set them on the table. So, these two go in the outboard sections of your fire truck and these two go in the inboard sections of your fire truck. When you look on the back, you’ll see the headlights have a “halo” wire attachment. These go to your marker light circuit or any of the park lamps in the fire truck. You just run that to a power wire. Usually, they are tucked right behind the headlight. 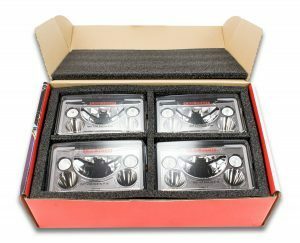 What Makes FireTech Headlights Special? I’ll show you on the high-low headlight. It’s that when you’re looking at the fixture, these optics right here are angled down. So typically, when you look at the shape of a beam for a LED headlight, we’re going to project light further away from the vehicle to keep the drivers from fatiguing early while driving a long distance at night. Because a lot of times this style of headlight is used by the over the road trucking market, at night time on long hauls. But in fire trucks, we’re responding typically in a different type of profile: We’re going 45 miles per hour or less on average (and we get it, you guys drive fast, but if you average it out, that’s the typical speed of a fire truck) and typically, it’s 15 minutes or less, so we’re not looking to reduce drive fatigue over a long distance driving at night. We’re looking to illuminate the foreground and illuminate the area near the fire truck, so that when you’re pulling on to an incident, you can see all the things around the fire ground that are important. So when you look at this headlight, this “half-moon” shape piece in the middle, that’s our standard DOT low beam and what make this unique for the fire service application is that we add these extra optics here on either side that tilt down a little bit and illuminate the area between the bumper and the bottom of that traditional low beam. It’s not like we bring all of the light in. We’re actually adding more light in those areas. What else is cool, if you look at this ring feature around the headlight, that’s a “halo.” That’s energized by this park lamp wire. But one of the most unique features about the headlight is this thing on the back. When you’re installing, you pull this little silicon vent cover off and this thing back here is called a GORE PolyVent. This is screwing in to the back of the housing. 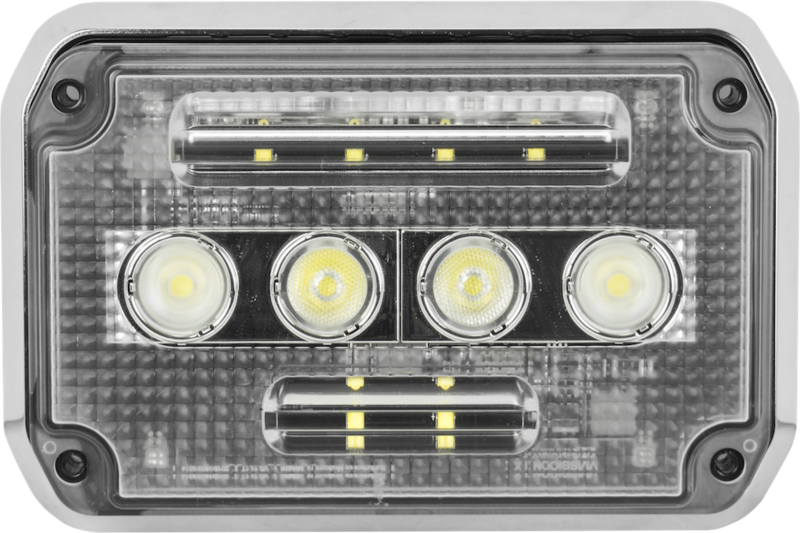 One of the things that we found during the engineering of this product, was that fire truck headlights typically operate hotter than headlights used in other markets because when you pull on to a fire scene, you stop. That lack of airflow while you’re driving and the headlights are still burning, causes the pressure inside of most firetruck headlights to increase, because the temperature is hotter. A hot headlight with high pressure inside eventually is likely to vent that pressure out between the little strands of copper in the wiring. In order to prevent that, we add this GORE PolyVent. That GORE PolyVent allows the pressure to equalize and it acts almost like a pop-off valve as the pressure increases, it blows air pressure out of that vent valve and then when it cools, it can allow ambient atmospheric air to come back through. But what’s neat, is that there is a membrane inside of there that prevents water entering back through that vent valve. So, with this headlight, you’re never going to have to worry about condensation building up inside the headlight and, if it ever does, that vent valve is designed specifically to allow it to vent out right away. With the FireTech headlight, you can take this thing out on the fire ground, you can let it get hot, and that pressure is going to equalize because we have a PolyVent valve. Once you get back to the fire station, even if you spray that hot headlight with cool water, it’s not going to get inside the headlight because that GORE membrane keeps the water from passing inside. We’ve got a couple of really great demo programs where you can put this using your truck, run them for 30 days, try them out and see what you think, and then if you like, keep them, if not, send them back, we won’t even charge your card. Anyway, looking forward to doing business with you soon. Thank you so much for checking this out. What’s up!? It’s Sam from HiViz LED Lighting. We’re here at the Firehouse World 2018 Show and we’re super excited to be here at this event. Thanks so much for having us in your city. This place is awesome, and we are looking forward to seeing you around the show. Come on inside and let’s check it out! Hi I’m Sam Massa with HiViz LED Lighting in the FireTech Brand Lights. 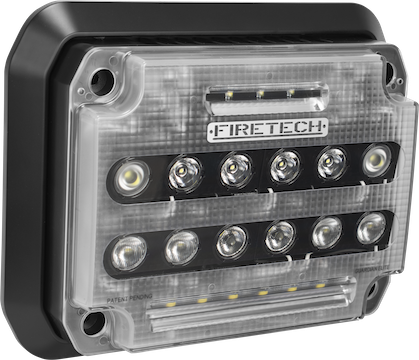 Today, we’re talking about the FireTech Guardian, which is our new Surface-Mounted LED Scene Light designed for the fire and emergency service industry. Now this thing is pretty cool. We offer it in two models, a 10,000 and 20,000 lumen effective equivalent type fixture. It actually makes about 6,000 and 11,000 measured lumens. I’ll talk more about that later. What’s cool about this fixture is we designed this that it can passively dissipate the heat generated from the circuit broad. So you see this is really big heat sink. What’s cool about this part is that when you turn it on, we’ll only lose about 10% or 15% of the light output when the temperature of the fixture with just thermal saturation. That’s unlike a lot of the fixtures in the industry that are really thin, they draw more power, produce more heat and the chips are affected by that temperature. There are a couple of cool features to this part. Number one, screws that hold this thing to the body of the truck and never touch the lens. From past experience working on an ambulance, a lot of times I have seen that light has a crack in the corner where the screw bolts in the fixture. With our fixture this screw always touches the aluminum slug, not the lens, so you’ll never have a crack right in the corner where the screw holes sink with the body. Another cool feature of the Guardian is the circuit boards are actually articulated down. So instead of having to take this fixture and mount it on a tilt, so that it shines under the fire scene where you wanted. We’re able to move the LEDs, the boards and the optics onto an aluminum piece of the slug, so we can still get heat sinks in the backend of the housing. We get the optics, so light displays where we went on the fire scene. So when you look at our videos, you will see the light comes straight down the body and then projects evenly along the scene for really great scene like pattern around the emergency vehicle. Last but not least on the back of this fixture, we have a part called GORE-TEX valve, so one of the things that happens when you turn a fixture like this on and there is airspace inside. As temperature increases as the chips reach their operating temperature, the pressure inside this housing also increases. Without the GORE-TEX valve, you have a build up pressure which can sometimes cause the seals to blow out. We’ve added that valve to allow the pressure to equalize inside this housing and then we allow for that to cool and contract, drawing in your backing without letting moisture pass through. It’s kind of special membrane. It’s coated the material, which prevents the moisture going through, so we can guarantee this fixture for as long as your trucks in service. Effectively a lifetime warranty on any of the products we build in the FireTech brand because of the few of those technologies. Hi! It’s Sam from HiViz LEDs. Today, I’m going to introduce you to my friend Jack and we’re going to do some modifications to Jack’s head that will help us understand how light hits fireman’s eyes and how we can reduce glare on the fire scene. Well, one of the things that is really cool is if you look at Jack’s face here, you will see how his eyebrows up top and then his eyeball is sucked back into the socket just behind that area, so the anatomic shape of the human face allows the top of your eyebrow, your hair, and the fireman’s helmet to act almost like a sun visor and keep light at your eyes. Now the problem is when lights are mounted low on a fire truck, they shine right into the face and that glare is something that a lot of times causes us problems on the fire ground. So how do you address that? You can either mount lights higher on the fire truck on the body, you can mount them on poles or you can put them on light towers. For every light on the fire truck, if we’re talking as a general package, then reduce glare by using elevation to your vantage as it is the best way to do it. Now what we’re going to do is remove Jack’s eyes and replace them with photometric light sensors, which is really cool. This little device can sense how much light hits this target. My hypothesis is that as light goes up in the air, we’re going to see a reduction light hitting his eyes with more light or the same amount of light hitting the area where we’re working, which in fact reduces glare. Anyway let’s see if we can quantify this, we’ll catch you outside. See you later eyeballs! Here we go? One eye down, one eye to go. Looking pretty damn good as you ask me. All right, we’re finished, here we go for the test! Now, Jack’s got two eyes, each one has its own independent light sensor. What this let’s us do is figure out how much light is actually hitting his eyes versus hitting him from the top of the head and being shivered by the shape of his skull. All right, so we made it outside. The way we have the things set up, is I’ve got pallet on a forklift with Guardian mounted in the front of it. That’s going to shine down and out all over the fire scene. This simulates the light, whether it’s on a body or up in the air. On the ground, we have a sensor mounted on this turnout gear. This turnout gear simulates anything that is fire ground equipment. It could be chain saws or whatever. The next thing we’ve got is Jack with light sensors in his eyes. What’s going to happen is this forklift is going to go up and we’ll calculate how much light hits the work surface and then we’ll calculate how much light hits the guy in the eyes and we’ll be able to identify what’s occurring on the fire ground to see if elevation really does make a difference in reducing glare, so let’s get this thing started. Now you can see a graph along the red and blue line, that’s the left and right eye. The green line, now with more light on target than the fireman’s eyes effectively shows reduced glare. This is pretty cool how this all works. But what you’ll see is elevating a fixture definitely reduces the amount of light hitting a fireman in the eyes. In the next step, we’re going to throw a hard hat on Jack and see what happens. Check this out. This is really cool. What you see here is where the shadow is now cast. His eyes are completely in a shadow, based in this little short brim of a hat. Now imagine it’s a fire helmet, it’s the same sort of deal. When you’re able to elevate the light fixture, use that hat brim to your vantage and you’ll keep light out of the fireman’s eye. So what you’ll see here is a sharper cut off. Right there is where the light fixture changed. Oops! I just walked over top of the sensor. But you’ll see right here. This is the difference in light elevation. We’re able to get such a sharp cut off using the brim of a hat, you’ll see here we’ve got almost no light getting the fireman in the eyes at all, meanwhile we’ve got an elevated amount of the light on the target. All right, the next step is we’re going to use a baseball cap and see if we can shorten this up anymore. What I want to see is if we can make this steeper cutoff using that brim and making the time elevation shorter. So, the lower light fixture is the faster we get the cut off and that’s what I’m hoping for. Check this out! We’ve got almost no light hitting the fireman’s eye. This is a very quick cut off and you’ll see it right about where the natural elevation the forklift. In almost no time we’ve gone from glare in the fireman’s eye to no glare at all in the fireman’s eye with more light on the target than the guy’s head. What Do our Light Glare Tests Show? What is this all tell us? 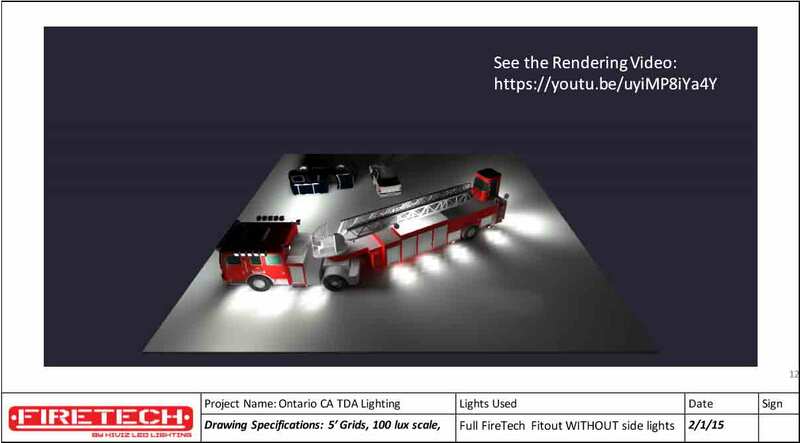 Well, when you look at the fire truck scene lighting package, it’s more than just taking a scene light and bolting it to the side of the body. 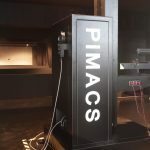 The best way to do that is to use some other principles we’ve learned here using our lighting equipment in the lab and to work with experienced lighting consultants like ones at HiViz LEDs. Our team members will help to come up with a package that effectively illuminates your fire scene, reduces glare on the fireman’s eyes and helps you do your job safer at night. 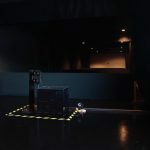 For more information, check us out online at hivizleds.com or go to our Facebook page, it’s facebook.com/scenelighting. See you later. All right, so here we are standing in front of Ontario California’s new tiller truck. It’s a pretty interesting history regarding the design process for how we came up with lighting package used on this truck. So a couple of years ago, here at this show, we met the guys from Ontario. We discussed ways to create the optimal light output needed for a safe and efficient working condition. During the process we began talking about how to create more lighting in specific areas that they need in front of a truck, so we started with a 72 inch FireTech brow light. 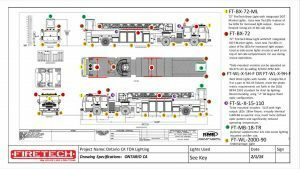 As our conversation evolved, they began asking other types of design questions that really helped us craft the right lighting apparatus for their newly designed fire truck. One of the things that HiViz offers is the ability to design a truck digitally, before it is every manufactured. This is done so we can recreate where the light falls and know exactly how much light is going to fall in any given point inside of the truck. This is called a fit-out guide. 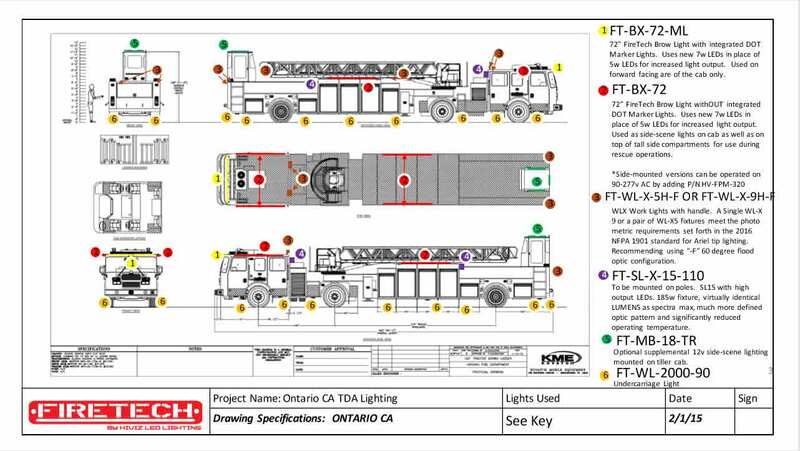 For the Ontario Fire Departement we started with the KNE 2D drawing of the truck. A KNE 2D drawing is what the truck manufactures uses for fits out when they’re configuring compartments and other truck features. Then our team took the 2D drawing and created a 3D rendering of the truck. We do this so we can represent how high and how wide the truck will be. From there we can fine tune which fixture would be best for optimal output. For example, we could say, “okay, let’s try this fixture with may be 10-degree optics, now let’s try with 60-degree optics” then we are able to tweak the optic pattern for each fixture whether it be for a brow light, a side-scene light or even up on the aerial. You will see the tip in tracking lights, the side scene lights, the pole lights and other fixtures. We change each one of the parts until we find exactly the right amount of light in every area near the side of the truck. Once we are done, we are able to guarantee NFPA compliance as well as maximize the light the customer is looking for different areas around the fire ground. Now this video-guided process is something we do at no cost for our customers. No matter where in the US your truck is being manufactured, our team is happy to provide you with the 3D video analysis so you can have the right light fixture installed at build, instead of retrofitting after the vehicle is on the streets. Anyway check us out online at hivizleds or give us a call, stop by one of the trade shows, we’ll be happy to talk to you about the HiViz fit-out guide process. I’m looking forward to meeting here at the event and thanks so much for all of your hard work. We’ll see you later. What’s up Rosenbauer dealers! It’s Sam from HiViz LED Lighting and I’m finally here! I made it to your plant up in Minnesota! Not only am I’m freezing, but I’ve also really enjoyed my time seeing all our great FireTech Brow Lights and other HiViz LED lighting accessories. There are a ton of these things around the new line of Rosenbauer fire trucks. As I was walking, I noticed all the orders saying Anchorage, Alaska, others from customers up in Canada and all around the US with FireTech Brow Lights on the front and it’s pretty exciting. I just want to take a minute to say thank you for all the hard work you guys are putting into making the Brow Lights and rest of our products a successful and integrated part into the Rosenbauer platform. This year, we’re going to be doing some work on our line of headlights. They’ve got integrated park lamp as well as a low beam and a high beam. It’s going to be similar in cost what you’re buying today from the high end part of the market. 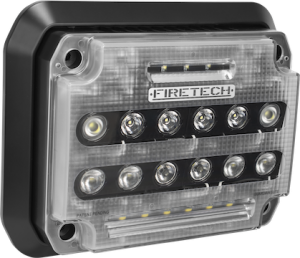 We offer a lifetime warranty and that’s the same thing as our FireTech Brow Light and any of the products badged with the FireTech emblem, they are guaranteed for the service life of your apparatus and our failure rate is less than 10th of a percent. So check out the headlights and, check out our Guardian and our Guardian Elite. These are surface mounted scene lights and 10,000 and 20,000 equivalent lumen output. This can be mounted on the side of cab, side of a body, anywhere a 7×9 sized fixture would work, and at FDIC this year, you’ll have to come by and check out the new Guardian Junior. That’s a new part that’s about 4×6 inches, a smaller fixture, that’s going to be 3000 measured lumens and about 6000 raw advertised lumens. Anyway, for more information about the HiViz LED Lighting brand, please stop by and say hello. I’ll trade business cards with you and certainly do a follow up. If I can come up and see your facilities, definitely, let me know, we’ll make sure we’ll plan it. And if you like to come to see ours, we’re in Asheville and we’re in Seattle; you’re welcome any time. 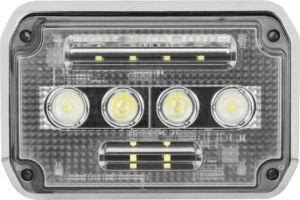 HiViz LED Lighting Releases a lifetime warranted surface-mount LED scene light for firefighters, designed by firefighters, with more light at a faction of the cost. Debuting at FDIC 2017, HiViz LED Lighting is yet again revolutionizing the LED Scene lighting industry. 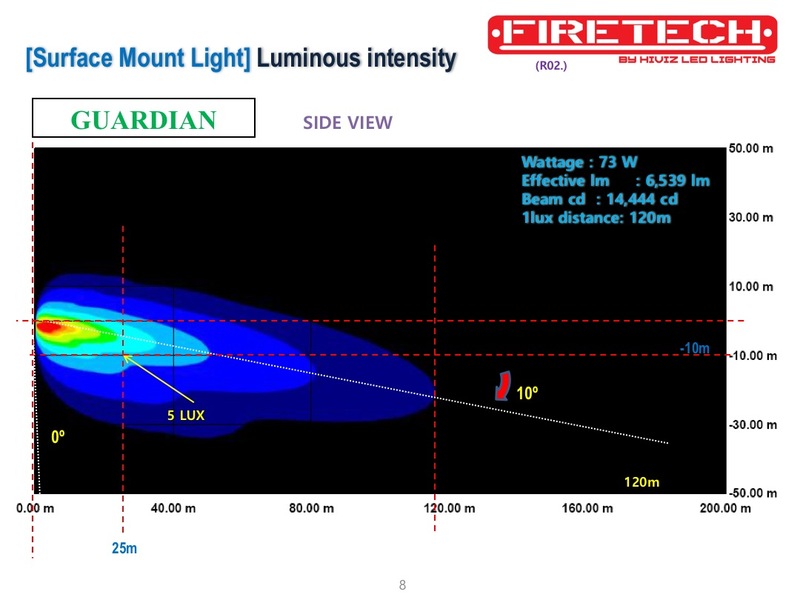 The FireTech “Guardian” Surface Mounted LED Scene light is designed to give superior light output, in the areas that are needed by firefighters and EMTs, for a fraction of the cost of the current competitive industry standard components. The Guardian LED Scene light is offered in two versions; the Guardian (standard), and the Guardian “Elite.” Both versions will use a 7.25”x 5.25” mounting hole layout which matches the most common 7×9 “900 series” fixtures in the industry. The Guardian LED Surface mount scene light will produce close to 6,500 measured lumens of light. It will also experience less than 15% thermal degradation after saturation. The Guardian is the perfect solution for your EMS fleet or when retrofitting fire apparatus on a conservative budget. The Guardian “Elite” is designed with larger Rescue and Firefighting apparatus in mind. It will produce an earth shattering 12,500 MEASURED lumens, which compares favorably against fixtures commonly advertised in the fire industry as 20,000 lumens or more. 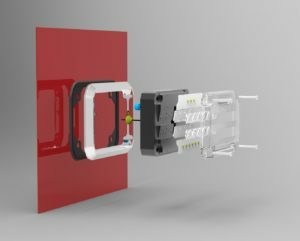 To make this fixture even more applicable to the Fire/Rescue industry, half of the circuit boards in the Guardian series of LED Surface Mounted scene lights are articulated 10 degrees down, putting more of the light created at the source (lumens) on the intended target (lux). 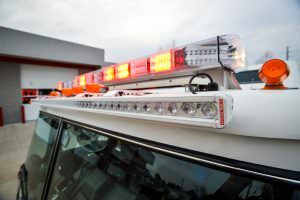 The Guardian LED Scene Light meets or exceeds scene lighting requirements set forth for Fire Apparatus in NFPA 1901, and in 1916 and the GSA KKK Spec for Automotive Ambulances. Getting the performance and optics is only half the equation. The team at HiViz LED Lighting is so confident in the anticipated success and long-term service life of this fixture, they are backing it with their industry leading Limited LIFETIME Warranty. 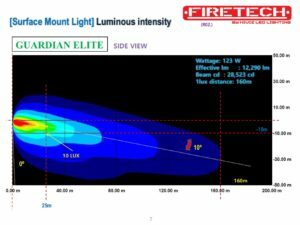 For more info about the Guardian LED Scene light, stop by booth 3754 at FDIC (ICC) in Indianapolis IA, Apr 24-27 2017. If you’re not at the show, please visit www.hivizleds.com or contact your nearest HiViz LED’s “FireTech” dealer to schedule a demo. The 2016 NFPA 1901 Standard has some changes to language that could save you a lot of money on your Ariel device’s Scene lighting package! In 2009 1901, if you were going to use a flood light on the tip of your Ariel device to light the waterway, (1901.19.18.6) it was required to produce “not less than 10,500 lumens.” For a traditional 500-1500w+ quartz fixture, achieving that output was no massive triumph, or shock to the wallet. However, with many departments opting for LED scene lighting, the cost of an LED fixture that produced 10,500 lumens could often climb as high as $1,200. In 2016, the requirements for fixture output change. First things first, NFPA moved to define how Lumens are to be measured. This was a huge problem in the past. Historically, each lighting manufacturer used their own measurement scale to come up with a “lumens” output number. 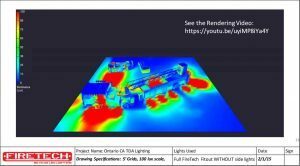 When a sample of 4 manufacturer’s 15,000 lumens LED fire market fixtures were tested by a 3rd party photometric lab, the data showed that the actual measured output varied by as much as 300%. This wasn’t necessarily malicious on the part of the manufactures, rather, because there was no standard, it left many important variables up to interpretation. Remember when the EPA regulated how Fuel Mileage was to be estimated by Auto Manufacturers? Same story, different application. Once the process for measuring was defined, the number was actually reduced from 10,500 “ambiguous” lumens to 4,000 “measured” lumens. For more info on measuring light output, check out this blog post from Dec 2015. ^ This language specifically requires a tool and a test to be preformed to measure the fixture output. In the past, no test was required and often light output was based on a calculation. From that file, a report can be generated that shows total luminous flux (how much light and the new pertinent NFPA required terminology), color temperature (how red, yellow or blue or purple the light is), the luminous efficacy (essentially how many measurable lumens per watt created), and the optic beam pattern. ^ This means that the light has to be turned on and allowed to get hot before it is measured. The reason behind this is that LEDs become much less efficient when they get hot, and managing that heat is one of the principle differences in how different manufacturers build their lighting products. Seldom do lights in the real world get turned on and right back off again, so this section requires that the test be preformed after the light is heated all the way up. 19.18.6.3. Optical Test Data shall be certified by the device manufacturer and the data shall be available from the device manufacturer upon request. ^ This is what changes the game. Because device manufactures are required to make their test reports available, it will hold manufacturers accountable and allow for fair competition in the market. Competition by manufacturers is a good thing for the consumer and ultimately saves them money. As a consumer or manufacture, you should request copies of ALL lighting Photometric reports to ensure your truck is compliant, and that you are getting what you paid for. Remember that $1,200 fixture that was required using the old language? 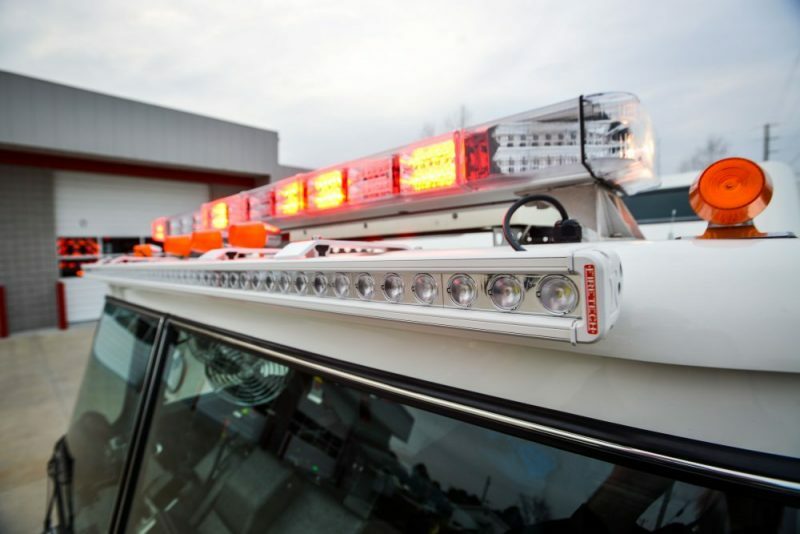 An example of a fixture that meets the new total Luminous Flux of 4,000lm is the $350 HiViz LED’s FIRETECH FT-WLX9, which in practice can offer a fire department up to $850 of savings and comparable or better light output. HiViz LED Lighting is proud to announce the launch of our newly redesigned website, built by TheeDesign, a Raleigh web design and internet marketing company. Our newly redesigned website is built around WordPress, a powerful and easy to use content management system that allows our team to make content, image and video updates with just a few clicks. We can also add new pages and post blog entries whenever we want, without a developer’s help. HiViz LED Lighting features an interactive navigation with an on-site blog to help our company serve as a resource for industry related news about the lighting solutions industry. Our new custom WordPress website offers clear navigation and an easy user experience for our visitors. Our homepage, company information, products and services, our blog and contact information are easily accessible. In addition to the convenient layout on the front end, WordPress features a user-friendly interface on the back end. In one hour of training, TheeDesign was able to teach our team how to post blog entries, update page content, upload pictures and videos, and manage our lead generation form. We found WordPress to be intuitive, simple, and easy to use, making our website more manageable than ever. Our website is now mobile friendly. This is an exciting new feature to our redesigned website. Using responsive web design technology, our site will respond and adapt according to the orientation of our viewer’s screen size and resolution. Now, our visitors can view and interact with our website on mobile devices, including smartphones, tablets, as well as standard-size computers, allowing easier access to our website and information. This cool feature also allows us to expand our reach and be accessible to our customers anywhere, at any time. TheeDesign optimized our new website’s content using special onsite optimization tactics. The optimization helps our website to rank in the search engines for certain keywords that our customers and target audience are searching for. Targeting our content to be user-friendly and search-engine friendly has helped to position our company as an industry leader in the lighting solutions industry. Our new site features a slideshow right on the home page to promote our featured products/services to our customers. By featuring our services right on the home page, our website visitors can easily find what they are looking for, and navigate through our products/services easily. The slideshow images are easy to change, so our team can swap out sild show phots and text as often as we like. In order to better showcase our products and services, our newly redesigned website has an advanced photo gallery. This feature is easy to use and allows us to upload pictures and details of our projects and services to give clients more information on what we offer. Our newly redesigned website now features an on-site blog, giving our team the opportunity to showcase their knowledge and skill in the lighting solutions industry while providing our visitors with reliable, quality content. The blog is easy and simple to update and helps position our website as a valuable asset to the lighting solutions community. Be sure to check it out for the latest company news. One of the most useful features of our new WordPress website is the online lead generation form built by TheeDesign. Our visitors are now able to request a quote or schedule a consultation simply by filling out the form on our contact page. TheeDesign taught us how to manage our form submissions which helps save our visitors time and simplifies the process for our office. Our Brow and Mini Brow product pages have an advanced filter search that allows users to find the exact part number they need by an easy to use drop down filter. Our registered partners will be able to download product specs when logged in. Overall, we are very proud of our site. We found TheeDesign through an extensive search for Raleigh Web Design in Google. After speaking with their team, we knew they understood our vision and were the perfect partner to help fulfill our specific needs with a new website design. We highly encourage our customers to explore our website and click through our features to see for yourself. Don’t forget to check out our blog, where we will feature industry news about various lighting solutions topics such Measuring Light Output. For more information about how we can help with your needs, fill out our form on our website, or call us at 703-662-3458.